Cut each cardboard tube in half. If using paper towel tubes, cut them into fourths. Paint each one a different color: green, yellow, orange, purple and red. You can change up the colors if you like! When the paint is dry draw on faces using a Sharpie marker. 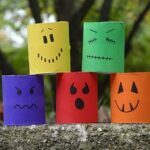 This project for Make Colorful Ghouls from Cardboard Tubes was printed from CraftsbyAmanda.com - https://craftsbyamanda.com/make-colorful-ghouls-cardboard-tubes/ and can only be printed for education or personal use.